For those of you who may not have heard the name, Bill is a legend of athletics and the cross country scene in our region, and beyond; a former England Cross Country President, as well as the man who refounded Wallsend Harriers to name but a few of his accolades. But without further ado, it’s over to Bill. At the recent Wallsend Harriers AGM I was approached by a member to see if I would do a piece with Sam Charlton well, I eventually caught up with him – he’s quick mind you – and managed to put a few questions to him and the likeable lad that he is responded in a highly-dignified manner. I had the pleasure of being in attendance at all of Sam’s successes the past winter – including his disqualification at the Northumberland Schools’ XC Championships – so I was keen to see how well versed he was when put under the microscope something that he will have to handle confidently in the coming years. So here goes and I hope you appreciate his answers as much as I did. Q: Lets start with how you came about joining the Harriers because I’ve been told you are a decent footballer and that was your early preference. A: I played football from when I was four-years-old until December, 2018. When I was 10 maybe 11-years-old, I did the Junior Great North Run with my football team and I absolutely loved. I was first out of the players on my team so I figured I must be a pretty good runner (for a footballer). It was then that I decided I wanted to join a club. Wallsend was the most local athletics club and I knew we had family members who had been part of the club (Colin and George Atkinson). Originally, my plan was to go to a running club to improve my fitness and stamina to help my football. It certainly helped. 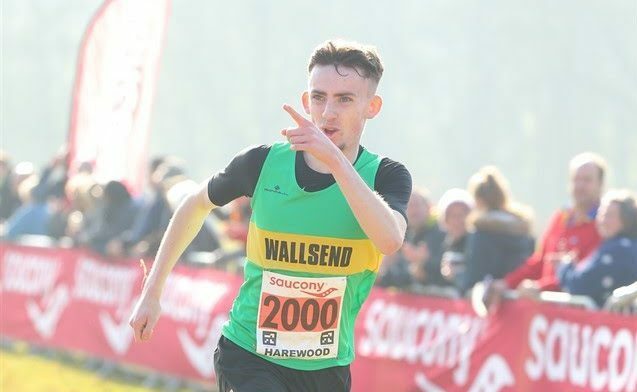 Q: Once linking up with Wallsend Harriers how difficult was it adapting to a new sporting concept and did it take time for you to accept that you’d made the right decision to give athletics a go? A: Athletics is a very different sport to football. Obviously football is a team sport compared to athletics which can be very individual at times. However, it was not difficult at all to fit in with the club and the sport. Working with Simon Williams, Barry Allsop and Steve Aird in the junior section when I first joined Wallsend was great as it felt like a team which I liked and was used to. I feel that Wallsend is the best club around for team spirit. I don’t think that there is any other club that will be as close as we are at Wallsend. Straight away I knew I’d made the right decision to take up athletics as I was loving it. It was also good to have another sport to take part in away from football. Athletics is a much more relaxed sport and especially as a junior, there was no pressure at all which was very different to football. It was nice to take a break from the pressure that come when you play footy. 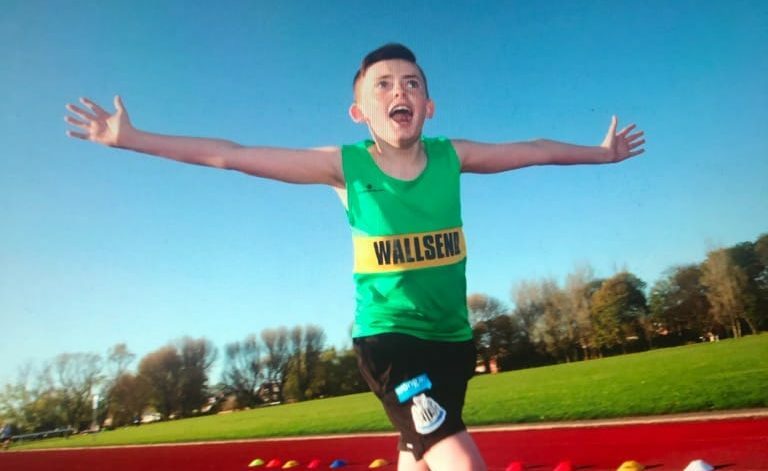 Q: Your first-ever race in a Wallsend vest was a Harrier League cross-county fixture at Blaydon competing in the under-13s where you finished 33rd, a position which was nearer the back of the field than the front! What are your memories of that day? A: It was the day before my birthday and I turned up with my brand new Green and Gold vest with Newcastle United shorts on and my school socks. I got on the start line in the slow pack. I went off like a rocket. For the first 200 metres I was in third or fourth place thinking wow, I’m pretty good, that was until I started drifting back. I didn’t understand how to pace myself (and, up to a point, still don’t) so I ended up suffering for the remainder of the race. Once I’d finished I was still really happy and realised that I loved it. I’ve watched the video back time and time again and my running style was absolutely wild back then. My arms were using most of my energy. Q: In your early days there was never a hint that you would go on and achieve so much success in such a short time, so has it come as a surprise to you as it has to many other observers? A: Yes and no. I never in a million years would have believed that I would have got to this level of athletics and achieved what I have done. However, when I think about my training and how hard I have worked to get to this level then maybe I deserve to have achieved something special. From the early days with the coaches in the junior section to now with Paddy, they have all helped me to get me to where I am today. Q: I ask that question for during your first two-to-three seasons with the club you barely competed at all though since 2017 that certainly changed where you contested distances from 400m to 6k over the country even having a go at the discus and javelin! A: In my first few seasons, I was still mainly focused on football. Training sessions and matches for my teams would always come first before athletics. There were periods that I would not train or race for the club for months due to games and training for my football team. I would only turn up at the harriers when I had nothing else on. I first started to realise that I was a decent runner when I came ninth at the Junior Great North Run in 2016. It all stemmed from there which kick started me turning up at the club for training more often and racing more. And yes, I even attempted careers in long jumping and javelin throwing but they were certainly short lived! Q: It’s certainly been a whirlwind couple of years since then though naturally, there have been disappointments along the way and I highlight last year’s London Mini Marathon where you finished back in 41st place just three weeks or so after finishing runner-up in the Schools’ Cross-Country International in Nottingham. How did you feel after that performance? A: I was on a high from the cross-country season that had just finished after gaining my first England vest and getting the silver medal at SIAB. However, I was very tired after completing my first proper season. It was a whole month until the Mini Marathon after my last cross-country race but I was suffering from shin splints as I started training for the upcoming season. I didn’t really tell anyone about the pain I had in my legs as I just wanted to get on with it. The London Mini Marathon was a tough race for me. It is such a great event that I, of course, wanted to perform well. I’m not a fan of running in the morning to begin with so waking up at 5:30 and racing at nine o’clock is not something I enjoy. I struggled from the gun in that race and I kept dropping back and back through the field. It was a shame as I didn’t get to enjoy the atmosphere of the last three miles of the London Marathon course. I’m sad that I am not going to be doing the Mini Marathon this year as well as it is a fantastic race to be asked to do. However, I don’t think that it will fit in with my long term plans for the track season so we’ve decided to give it a miss. Q: That setback certainly didn’t phase you at all but no one, me included, could see you taking on and beating everyone a few months later to lift the coveted three titles: the National, Inter-Counties and English Schools, the triple crown of cross-country which may not have been achieved by anyone before you. Of the three championships which gave you the most satisfaction? A: All three races were amazing and amazing for different reasons. The English Schools’ was great because it was the one that secured the hat-trick. I was running as a bottom year in the senior age group and it was great to finish the season with victory against the older lads. The British Inter-Counties was a tough one for me as I’d been ill the week leading up to it and was very close to not lining up at all. To get through the race and win was a huge surprise that I don’t think anyone close to me expected it, especially as to how the race panned out in the early stages. However, the English National at Harewood House in Leeds is probably my favourite. To have 20-plus Wallsend Harriers there to see me race and celebrate the win with me was unbelievable. It was a fantastic day (apart from the bus incident) and it was great to have so many of the Green and Gold there with me. Of course, to top the season off with my face on the front cover of AW was very special as well. Q: Turning away from cross-country activities, last year was a bit of a breakthrough for you on the track where you set pb’s at 1500m and 3000m before going on to win the English Schools’ title and the Schools’ International over the longer distance. Together with Paddy, how do you see this summer panning out? A: Paddy and I have already talked about what we want to do this summer. Last track season was great but long and tiring due to the amount of races that I had to do, especially over the 3k distance. We are going to prevent that from happening this year and already selected the races that we feel are the most important. I know the times that I want to get and believe I am capable of doing. There is the European Under-20 Championships this summer and it would be great to get the qualifying time for the trials and then see what happens from then. If I’m not fast enough yet to get selected for the champs, then that’s fine as long as I know I’ve given everything in trying. If I can get my first GB vest, then that would be unbelievable. If I don’t make the Euros then I will of course be doing the English Schools’ which I loved last year and will be hoping to make a good account of myself again. 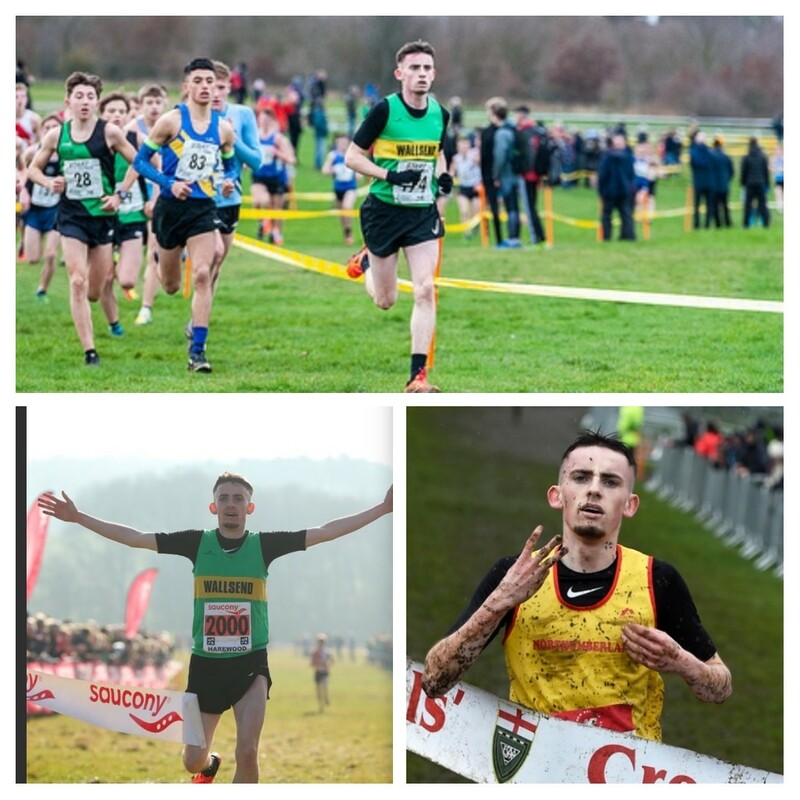 Q: With your school days nearing an end – though will you be defending your XC title next year – your attention will be turning to going to university. Many of the UK’s leading athletes, particularly endurance athletes, tend to favour linking up with a university in America so what are your thoughts on that idea when your school days are over? A: Quite a few of the top athletes in the year above me are signed up with universities over in the States and they say it is great over there. At the moment, I’m keeping my options open as I know that the university system here in the UK is also very good. I’ve had contact from a few US universities already about potential scholarships but I’m not making any decisions as of yet. I need to look into it a lot more before I decide where I feel is best suited for me. Q: Looking back over the past few years can you highlight what you feel is your greatest achievement so far and what are your aims and targets for the future? A: So far my greatest achievement has to be the treble of cross-country titles. It is something that not many people have done and to be on that list is a huge thing. My aim for the future is to continue my progression, win more titles and make it to an international level. My main goal however is to put Wallsend Harriers on the map. Make it a club that is known all around the country and be able to compete with the rest of the best. That’s what the club deserves and I want to help it get there. I know this is the goal for everyone else in the club as well and I believe that we can all do that. Q: While, naturally, you receive all the plaudits for your achievements, however, there must by numerous people who have helped and supported you every step of the way that you would like to thank? A: My family are my greatest supporters. They have been behind me throughout and I don’t know what I would have done without their endless support. They take me wherever I need to be, help me prepare for every session or race and of course finance most things, not everything but most things! Everyone at the club has been huge in my development. From those that I train with to team captain Simon Lyon to club chairman Bill Todd. They have all helped and supported me immensely. The biggest contribution though is from the main man, Paddy Dinsmore. After I finally learnt how to understand his accent, I figured he was a pretty good coach. He has managed to get me to where I am today. His dedication, hard work and fantastic training plans have been the reason for our success so far. Early Saturday morning hill reps in the rain and snow, trips around the North East and the country to races and hours working on plans for the season are hugely appreciated. I’m sure we will achieve lots more together in the years to come. Q: Finally, while still relatively young and still a teenager, what would be your advice to any youngster wanting to give athletics a go. A: Athletics is a great sport which not many people realise until they get into it. Anyone can do it. No matter the age or ability, it is available for everyone. It doesn’t matter if you want to make it to the Olympics or just do it for fun. I’ve always been surrounded by great people throughout my time doing athletics and made some life-long friendships. What I’d say to those who want to go far in athletics is that no one has a limit to what they can achieve. If you want something, you can get it but you have to be prepared to work tremendously hard to get there! I hope everyone who found the time to read the article found it enlightening. Sam’s reading of athletics is astonishing for someone so young which augurs well for many happy and successful years to come in the sport! « Danielle’s living the dream! Fantastic read and shows the maturity needed to go far in this sport… great questions from Bill. Brilliant article, brilliant lad! Brilliant coach, brilliant club and brilliant journalist! Long may it continue!